During a decade of sound performances and recordings, Tasos Stamou has developed a unique style of live electroacoustic composition. Long and continuous pieces are created on stage or in the studio using a “portable electroacoustic music studio”. 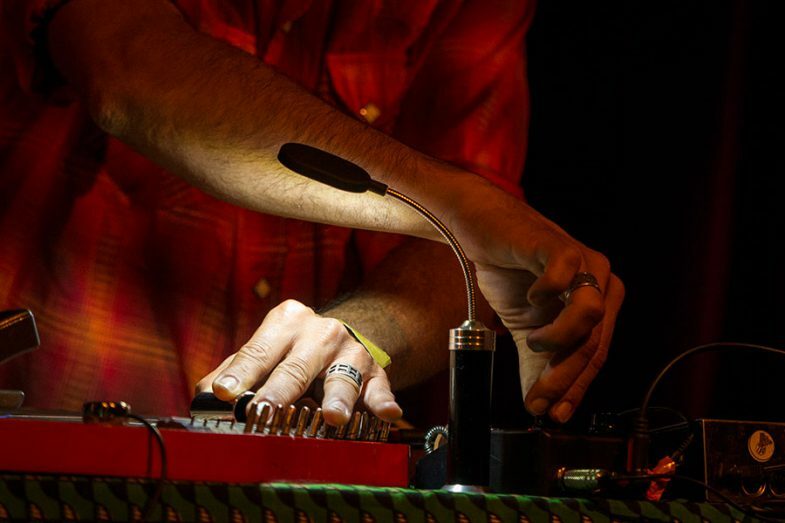 His gear consists of acoustic (prepared zither, reeds, recorders, objects) and electronic instruments (handmade electronics, modular synthesizer systems and live processed feedback loops). Based on sustained tonal textures and free improvised instrumental solos, his live compositions create a particular and unique atmosphere of ritual noise. Tasos Stamou has an eclectic body of recorded work, released by exploratory music labels (Moving Furniture, Lal Lal Lal, Linear Obsessional Recordings, Orila, Triple Bath, Kukuruku Recordings, Absurd, Coherent States). He has performed across Europe and the U.S. in festivals and venues for innovative sound (Incubate Festival, Cafe OTO in London, Supernormal Festival, BENT Festival New York, Cave 12 in Geneva, Sounds of the Underground Festival, Ausland in Berlin, CologneOFF Festival, Onassis Cultural Centre in Athens, and many more). Although mainly a solo performer and recording artist, he frequently collaborates with other sound artists, improvisers and experimentalists (such as Adam Bohman, Alan Wilkinson, London Improvisers Orchestra, Mike Cooper, Andrea Parkins, Kuupuu & Lau Nau, Terry Day, Adachi Tomomi, Ilan Manouach, Ignaz Schick, Magda Mayas, Arma Agharta, Thodoris Ziarkas, etc.) at various venues and festivals for innovative music. Although his music is inspired by different contemporary and traditional genres (free improvised music, musique concrète, noise & drone, folklore and ritual/tribal music) his main influence is personal states and experiences of the sonic environment, such as early childhood memories (“Infant”, 2007), the loss of a beloved person (“The return of the long lost one”, 2013) or the experience of a rural festivity (“Koura”, 2016).